This page started on 27 Feb 2012. It will be under construction for a while. This page languished for many years. I grew up in Aliquippa, not too far from McKees Rocks but I don't know very much about that town. Many people from Sant'Eufemia moved to McKees Rocks when they cam to the US. I will be making an attempt to get this page going again. Pasquale was born in SEaM in 1902. He died in McKees Rocks in 1943. Daisy was born Desolina Margherita diGiovine in SEaM in 1909 and died in 1994.. They married about 1924 and had four sons; Joseph, Samuel, Charles and Edward. Francesco "Frank" Mancini (1884-1977) and wife Maria diPietrantonio (1887-?) were married about 1906 in SEaM. Their first son, Vincenzo "James" was born in SEaM. 6 more children were born in PA: Anthony, Nick, Mike, Albert, Ernest and Helen. James opened Mancini's Bakery in 1926. James died in 1977. Ernie joined his brother at the Bakery after the War. Ernie died in 2004. Ernest J. Mancini, longtime owner of a family bakery in McKees Rocks whose bread became a Pittsburgh culinary trademark, died Thursday. Mr. Mancini, of Windgap, was 84. Feisty and athletic until leukemia sapped his strength, he was more like a peer than a patriarch to his grandchildren. "He used to say he was the best dancer and the best wrestler in his high school. And he danced until the end, until he couldn't walk anymore," said his grandson Ernie Hartner, 24, who with his brother and cousin runs a branch of Mancini's Bakery in the Strip District. A McKees Rocks native, Mr. Mancini was the youngest of seven children who all worked in the bakery that his brother, Jimmy, founded in 1926. He studied business administration at Duquesne University for two years before joining the Air Force in World War II. He served as a top aide to a ranking commander. He would often proudly tell the story about when the war ended, he used his connections to wrangle a Jeep-load of food and orders for a fictitious mission into Italy from his base in Germany, Ernie Hartner said. Mr. Mancini drove to his grandfather's native village in the Abruzzi mountains and delivered food to the starving inhabitants. When the villagers realized whose grandson he was, there was dancing in the streets, said his grandson, who recently met a relative who was there. "In that little town, he's regarded as a big hero," Ernie Hartner said. After the war, he went into the bakery business with his brother and married Emma, the daughter of one of his father's friends. The bakery was already renowned for its signature Italian twist loaf, and Mr. Mancini was loath to tamper with success. He adopted some automation, but insisted on letting the dough rest before baking. Today it still takes more than four hours to prepare a loaf of Mancini bread, using the same recipe his brother started with in 1926, said his daughter Mary Hartner of Robinson, who has run the business since Mr. Mancini retired 22 years ago. He was in constant motion, she said, rising in the middle of the night to handle problems at the bakery. But he was not obsessed with work. "My dad was a lot of fun. He was always ready for a party," she said. The bakery was supposed to have passed to her brother, Frank. But his death in a motorcycle accident drew her into the business. Her father showed her the ropes, then stepped aside quietly. He took his grandsons to lunch weekly, starting when they were in grade school, and golfed daily at the Chartiers Country Club. There, Mr. Mancini co-founded the annual Ogad Festival -- which, with no apologies for political incorrectness, was "dago" spelled backward. It was a males-only event, its tables heaped high with loaves of Mancini bread, salami, sausages and other Italian delicacies, while accordion players added to the ambiance. In his heart, Mr. Mancini was always 25 years old, Ernie Hartner said. "When I would come home from college I'd have lunch with him every single day. I golfed with him, played gin with him," he said. They made the rounds of his favorite restaurants, where Mr. Mancini walked straight-away into the kitchen to greet the chef, and kissed the cheeks of waitresses who brought him special cakes and gift bottles of wine. "Anyone who met him fell in love with him. A lot of my friends called him Pap," Ernie Hartner said. When his younger daughter opened a gym, he visited her daily and helped her out by running errands, Mary Hartner said. But he was never one to tell his children what to do with their lives. And he never pushed his grandchildren to follow him into the bakery business. "He probably put more pressure on them not to do it. It was, 'That's hard work. You guys all have good educations,' " she said. Nevertheless, when his grandsons and their cousin put aside other careers to start a Mancini's in the Strip, "I think secretly, deep down in his heart, he was real proud," Ernie Hartner said. Besides his grandson and daughter, Mr. Mancini is survived by his wife; another daughter, Amy Mancini of Bridgeville; two brothers, Albert of Kennedy and Mike of Mercer; and two grandchildren. Visitation is today from 2 to 4 and 7 to 9 p.m. at Anthony M. Musmanno Funeral Home, McKees Rocks. Services will be private. A bakery worker knew what Jaclyn Leto wanted without her even asking. Spying the little girl's eyes hungrily following the hot rolls, the worker leaned over and handed her one. She picked at the hot crust gently, then took a huge bite. "I like to shove it in my face," Jaclyn, 10, of Stowe, said through a mouthful. Mancini's Bakery in McKees Rocks is celebrating its 80th year, built mostly on experiences like Jaclyn's. Housed in a pale orange brick building on Woodward Avenue, the business is a local institution and something of an anomaly in an era dominated by chains and big-box retailers. For thousands of Pittsburghers, Mancini's is something simpler and grander: A tradition spanning generations. Tom Taylor Sr., for example, has been eating Mancini's bread for all of his 58 years. He lives in Lake Latonka, Mercer County, but Mancini's still beckons him home to the McKees Rocks area, where he grew up. "When I was little, going to church and Sunday school, my brother was in the service and we used to stop and get a loaf on the way home," Taylor said. "(When I was older), the whole lot of us would go to football games and we'd come here and get loaves and eat them at the game, and on the way home." For Mary Mancini Hartner, 58, of Robinson, every delighted smile is confirmation that she is keeping alive a legacy willed to her by her uncle, James, and father, Ernest. The eldest of eight children, James Mancini founded the bakery in 1926 after emigrating to the United States from the Abruzzo region of Italy when he was 5 years old. An experimenter and a bit of an independent spirit, James Mancini eventually stumbled on the right combination of flour, water, yeast and sugar and went into business for himself in a little garage in McKees Rocks. Hartner's father, Ernest Mancini, became James Mancini's partner after returning home from fighting in World War II. Ernest Mancini planned to hand the business down to Hartner's brother, Frank. But a series of tragedies thrust Hartner into the business. James Mancini died in of lung cancer in January 1977. In July, Frank Mancini was killed in a motorcycle crash. Hartner, who was living in Greensburg caring for a young son, returned to McKees Rocks to help her father keep the bakery going. They worked side-by-side until Ernest Mancini's death in 2004. "It was hard because you have your own ideas about business," said Hartner, who acquired a master's degree in business administration from the University of Pittsburgh in 1975. "But when you work for your father, you have to do it his way. I had to learn the baking end, the business end and the Ernie end." Suppliers, customers and diets have changed, even in the two years since Ernest Mancini died, Hartner said. The mom-and-pop restaurants that peppered Pittsburgh neighborhoods once were the bakery's bread and butter. In recent years, however, those eateries have given way to chains, who supply their own bread. And, of course, there was the low-carb craze. "I was doing demonstrations in supermarkets and people would come up to me and say 'How can you sell this poison?' " Hartner said. To stay viable, Hartner and her cadre of 26 bakers have moved beyond their signature Italian breads, just as James Mancini would have wanted it. Years ago, he added rye bread to the Mancini's mix. Frank's lasting contribution is the bakery's raisin bread. Hartner's son Nick, who started the McKee's Rocks Bread Company with his brother Ernie, is responsible for the bakery's latest creation: European multigrain. The bakery also has added trendy loafs such as focaccia and cranberry walnut, along with a line of sauces and spreads. Still, for many people, the allure of Mancini's is tradition, not trendiness. Carmen Fratto, 73, of Kennedy, remembers buying Mancini's bread for three cents a loaf. "Mom would send me and my sister to run errands," Fratto said. "She'd give us a bag and we'd get twists and carry it home between us." One Mancini's tradition is particularly enduring, said Yvette Leto, Jaclyn's mother. "If you are taking it somewhere, especially if you buy it hot," she said, "it doesn't quite make it to its destination." In Dec of 2018, Carmen Mancini sent a photo from the 15 Feb 1921 funeral of Antonio Gargaro. This photo shows many of the Italians (many probably from Sant'Eufemia) who attended the funeral. Antonio had just come to the US on the 1st of Feb. His death certificate shows that he died a few weeks later of Lobar Pneumonia. Can you help identifying anyone in the photo? 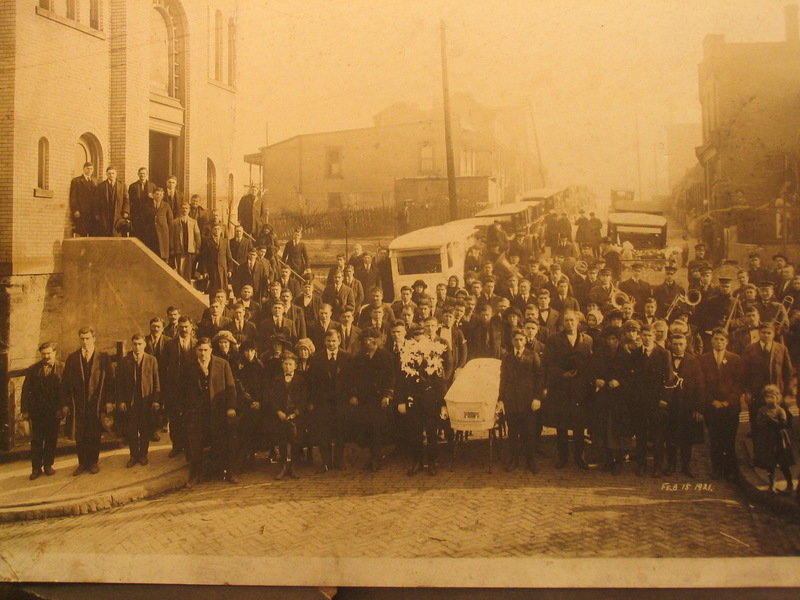 You have my permission to add the funeral photo, dated February 15, 1921 to the McKees Rocks portion of your site. On the left in the front, the young boy with a bow tie and a hat in his hand is Doctor Dantini. To his left toward the casket, is Angelo Gargaro and his wife, Mary Palmeiri Gargaro, the deceased’s brother and sister-in-law. On the right side of the casket, the second man, tall with a hat in his hand, is my father, Nicola Mancini. On his left is Unen Salvitti and her husband, Camillio Salvitti, my father’s cousin. The young girl behind that couple is Mary Mancini in the second row. She is my sister from my father’s first wife, Maddalena Rinaldi. Thank you for all you do for history. Thank you for the introduction to Carmen Mancini. We have had three very interesting conversations and he shared a 1921 group photo at a funeral that includes my grandfather, Amabile. That is my grandfather, in the bow-tie, standing behind and to the left of Nick. My grandmother Nunziata would be alive in that year, but no obvious candidate for her in that photo.